Once again our partnership with Green Scene Mom is allowing us to provide this awesome giveaway opportunity! Check out these awesome products and enter to win at the bottom of this post! Good luck y'all! The Green Scene Mom Awards celebrate niche, eco-friendly products and innovative product designs. We are very excited to announce the 2014 Fall Award Winners! Many of these great companies have also contributed prizes to Green Scene Mom's Fall Awards Giveaway. Enter to win below! Enter to win this amazing $400 prize package of award winning products! A couple of weeks ago, we were contacted by Protea Wines.They asked if we'd be interested in partnering up with them for their upcoming campaign, Art Blossoms. 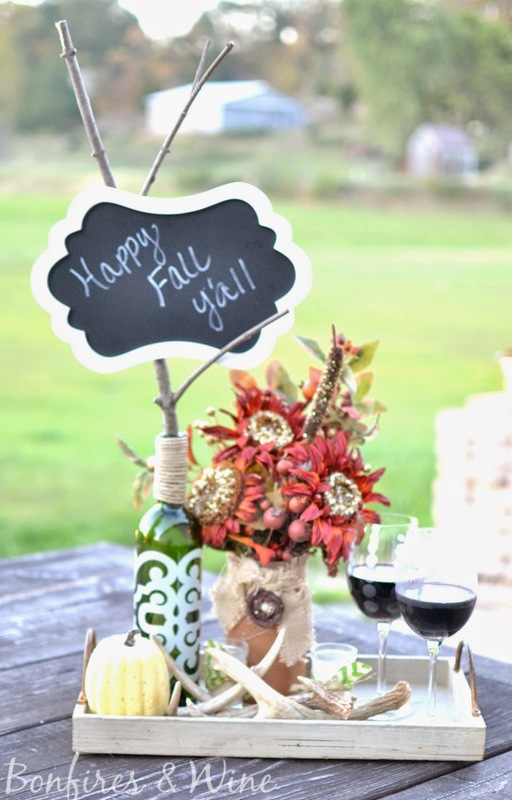 Basically they'd send us two bottles of wine to drink and then we were given the task to create something using our empty wine bottles. After we had this beautiful new masterpiece completed, Protea would choose several of their Pinterest followers to win the art created by all of us bloggers! How awesome is that!?!? "Protea Wines is proud to present Art Blossoms, a campaign by women, for women with the goal of encouraging art and sustainability to blossom all over the country. 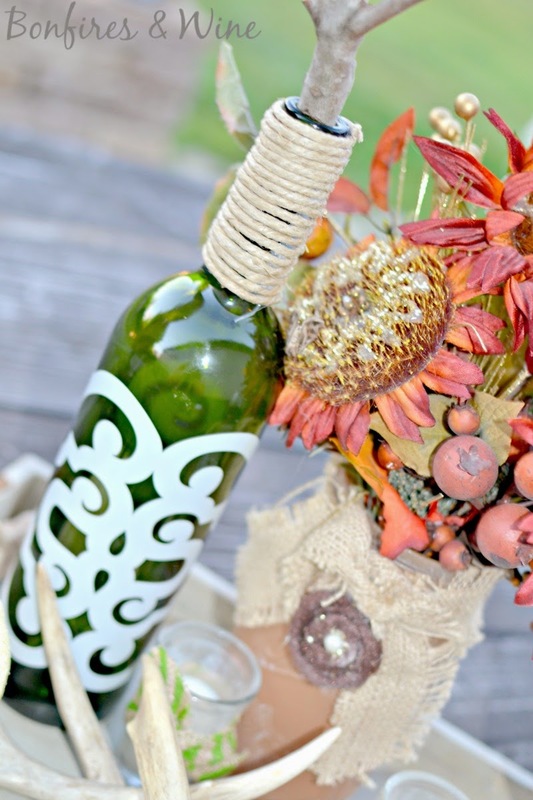 Designed for upcycling, Protea wine bottles motivate others to create beauty and express individuality. 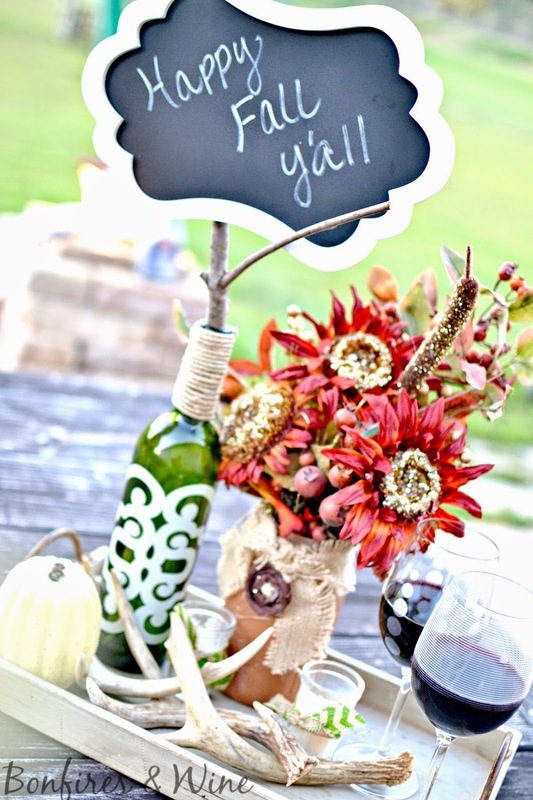 That's why we've invited some of the most inspiring women on Pinterest to make something new with our wine bottles. 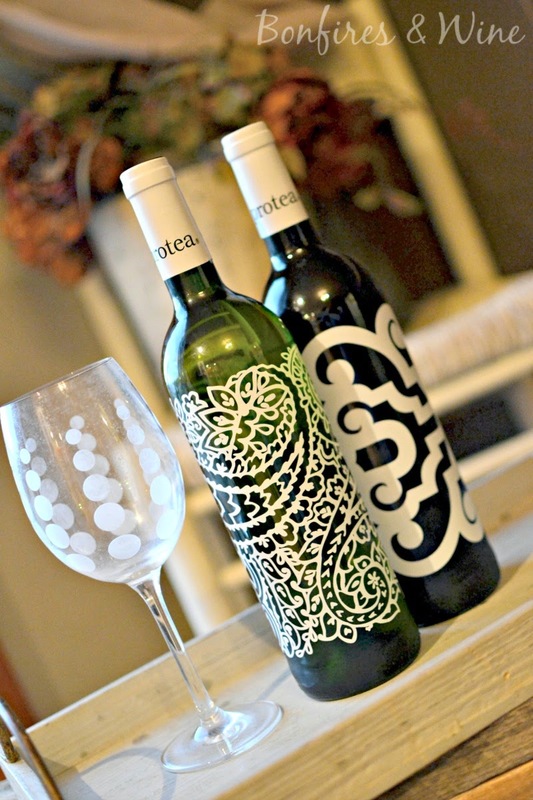 Win one of these beautiful creations for yourself - all you have to do is follow the Protea Wines Pinterest page!" 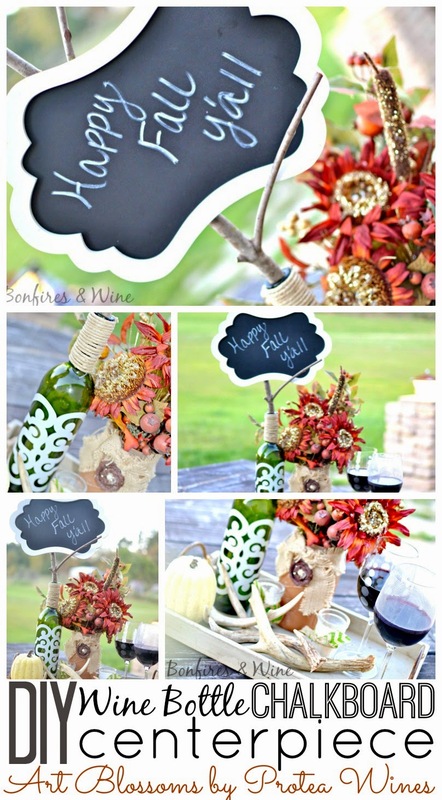 So here's what you'll need to create your own Wine Bottle Chalkboard Centerpiece (just in case you don't win this one!). 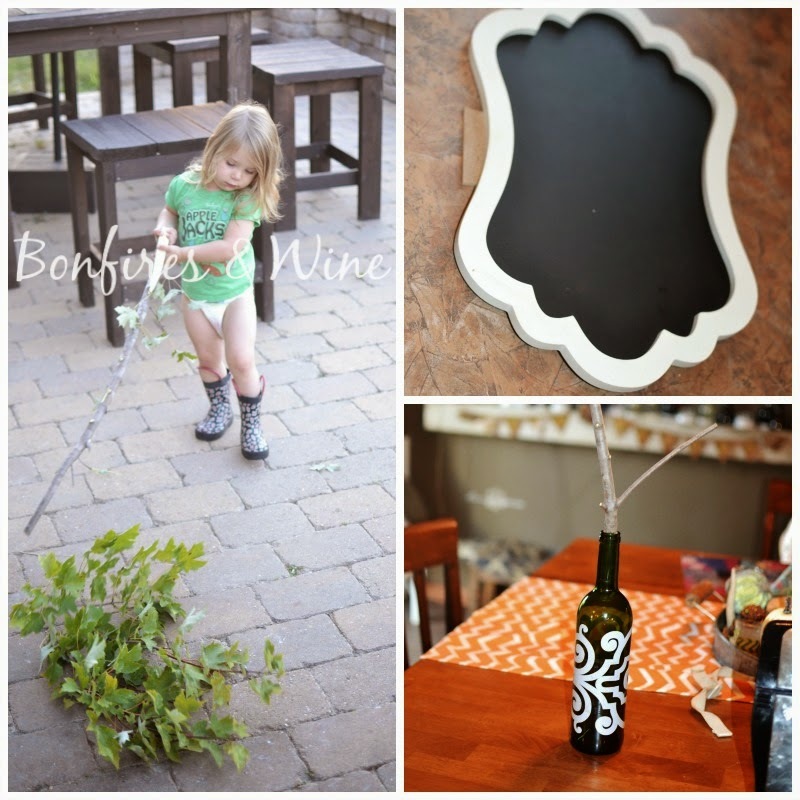 A tree limb that will fit somewhat snuggly into your wine bottle. We decided where we wanted the chalkboard to be on the tree limb and I market it with a pencil. Then, I put a line of hot glue right over my pencil line. We added more hot glue to the edges once we had it secured. 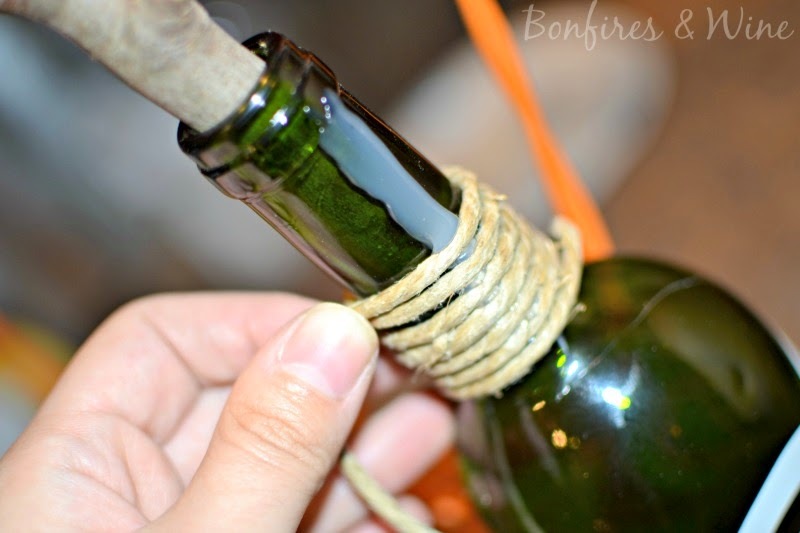 We let that dry and then added jute to the neck of the bottle also using hot glue. I wrote on the chalkboard and we were done! 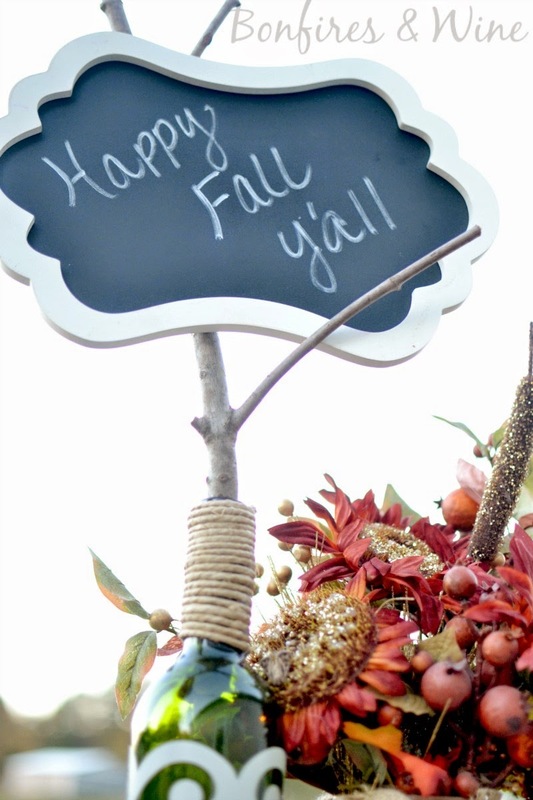 This was a super simple, easy and cheap craft that makes for such a cute centerpiece! 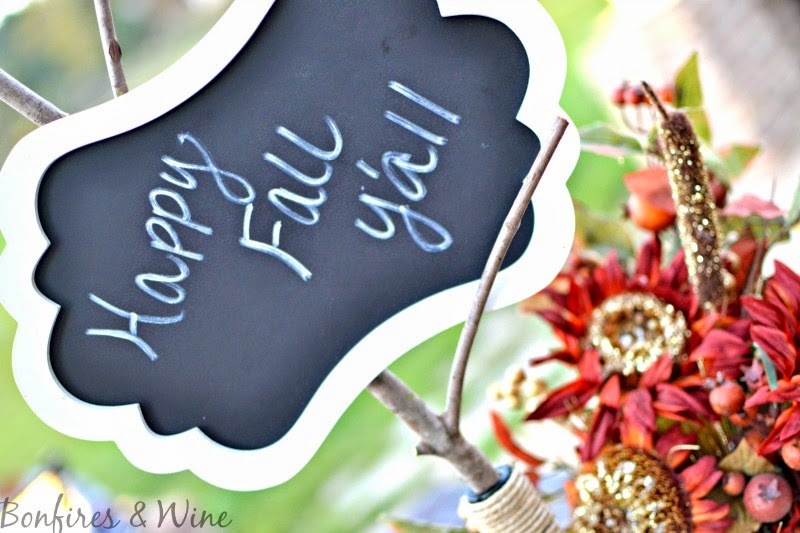 It could even be used for your daily menu planner or a "Welcome" sign for your entryway! Sooo...what do y'all think? We're so happy with how it turned out and cannot wait to send it to one of the winners! 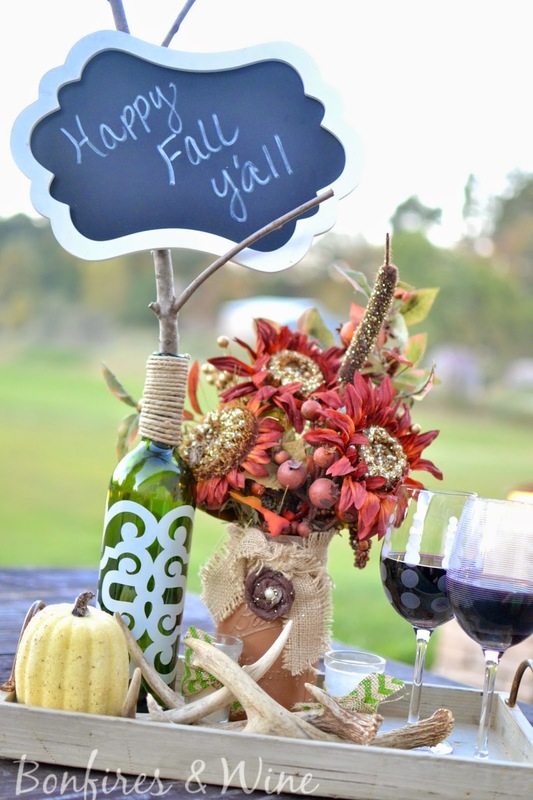 Make sure you're following Protea on Pinterest for a chance to win! Thanks so much for stopping by today! Hope you have a great week! 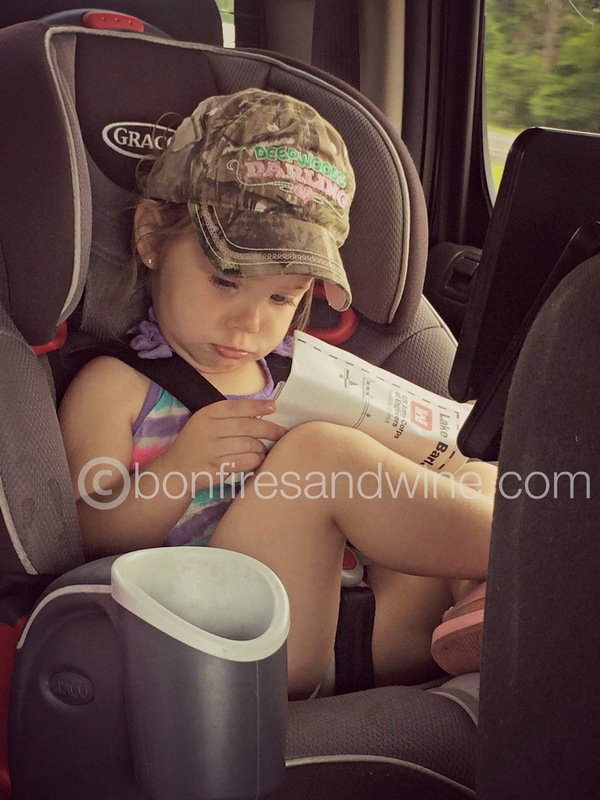 My baby's not a baby anymore..
She was a two and a half year old, sassy, blue eyed, little girl. She was all of about 36 inches covering what seemed to be a California king sized bed. She seemed so small. Too small to be in a big girl bed, with a big girl comforter, in her new big girl room. Thank God she still wanted to sleep with MooseMan and Lambie or I may have actually lost all control and sobbed uncontrollably. 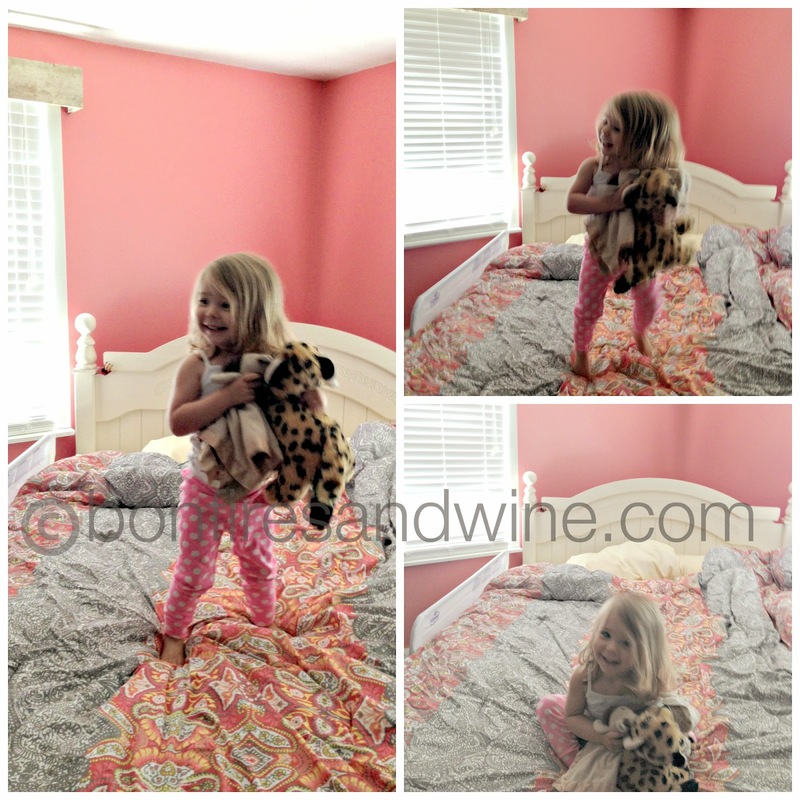 We even added in a cute little leopard we now call "Spotty" just to make the new bed, new room, new routine seem a little bit more fun. He helped in some weird way. She got up two or three times before actually closing her eyes and going to sleep. We talked to her, laid down with her, sang to her and assured her we weren't more than a hallway away. Thank God for video monitors and two-way speakers on those things. I sang "You Are My Sunshine" about a dozen times into that little handheld thing. And slowly, but surely, those beautiful little glowing eyes in the monitor quit wandering...and they closed. They stayed closed until about 4AM. The above process took place all over again and lasted about an hour and a half. A dozen more Sunshine songs were sung and countless of trips up and down the hallway, sprinting back to our room to watch her on the monitor. That monitor felt like my lifeline. And, I think it was that first night. We woke up the next morning and decided to have a jumping on her bed party to celebrate her sleeping in her big girl bed. We jumped, we sang, we screamed and cheered, and the smile on her sweet little face was priceless. The second night came around. It was bedtime. Only one song was sung, only one sprint was made down the hallway and my hand wasn't nearly as numb the next morning. 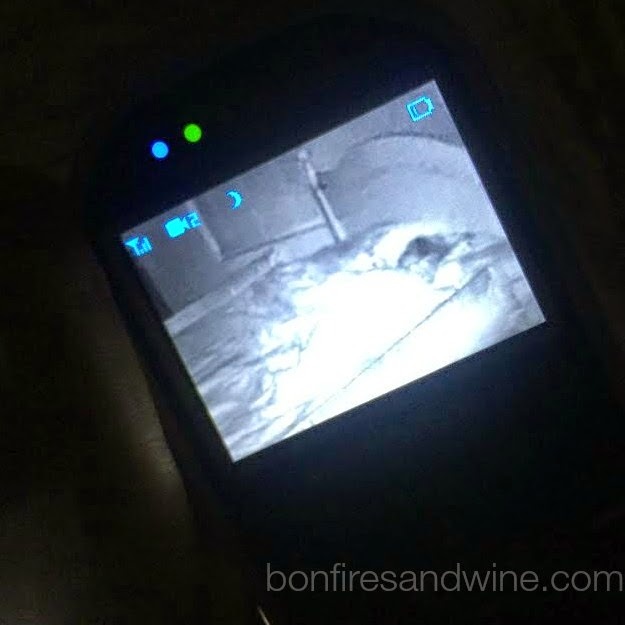 My baby slept all night long in her big girl bed. My sweet baby's not a baby anymore.